In 1742, Boston’s wealthiest merchant, Peter Faneuil, as a gift to the city, built Faneuil Hall. The edifice was home to merchants, fishermen, and meat and produce sellers, and provided a platform for the country's most famous orators. It is where colonists first protested the Sugar Act in 1764 and established the doctrine of "no taxation without representation." Firebrand Samuel Adams rallied the citizens of Boston to the cause of independence from Great Britain in the hallowed Hall, and George Washington toasted the nation there on its first birthday. Through the years, Faneuil Hall has played host to many impassioned speakers, from Oliver Wendall Holmes and Susan B. Anthony to Bill Clinton and Ted Kennedy, always living up to its nickname, "The Cradle of Liberty." To better accommodate the merchants and shoppers, Faneuil Hall was expanded in 1826 to include Quincy Market, which was designed in the then-popular Greek Revival style and later dubbed for Boston Mayor Josiah Quincy. The market remained a vital business hub throughout the 1800's; but by the mid-1900's, the buildings had fallen into disrepair and many stood empty. The once-thriving marketplace was tagged for demolition until a committed group of Bostonians sought to preserve it in the early 1970's. Through the vision of Jim Rouse, architect Benjamin Thompson and Mayor Kevin White, the dilapidated structures were revitalized, thoroughly changing the face of downtown Boston. The 1976 renovation was the first urban renewal project of its kind, one that spawned imitations in this country and abroad. Today, what is known as Faneuil Hall Marketplace is still Boston's central meeting place, offering visitors and residents alike an unparalleled urban marketplace. The unique and burgeoning array of shops, restaurants and outdoor entertainment have made it a premiere urban destination that attracts more than 18 million visitors annually. A Boston National Historical Park cooperating site. This old market building, first built in 1742, sits at the site of the old town dock. Town meetings, held here between 1764 and 1774, heard Samuel Adams and others lead cries of protest against the imposition of taxes on the colonies. The building was enlarged in 1806. Frederick Douglass, William Lloyd Garrison, and Lucy Stone brought their struggles for freedom here in the 19th century. Market stalls on the first floor service shoppers much as they did in Paul Revere's day. 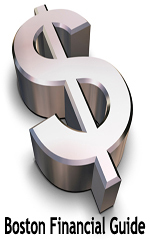 Peter Faneuil (1700-1743) had gained his wealth the old fashioned way, he inherited it from his uncle Andrew. In the early 18th century Boston lacked a central marketplace. Pushcart vendors circulated through the town, offering limited assortments of food on their own schedules and terms. To benefit the town Faneuil offered to build and donate to the city its first market. Food vendors vigorously opposed the gift, which the town meeting accepted voting 367 to 360. Besides being a source of wealth and trade, the Atlantic Ocean was the Boston's dump of choice for its various wastes, excess materials from building, and debris from fires which often razed large tracts of the city. Periodically this mess would be filled over, and built upon as new land. Such was the case with Faneuil hall was built at the water's edge in 1742. After just nineteen years the hall burnt, but was speedily rebuilt through a public lottery. In 1762 Faneuil Hall housed the first shouts of colonial rebellion. Samuel Adams, James Otis, and Dr. Joseph Warren stirred opposition, which was followed throughout the colonies, and galvanized resistance to colonial rule. By 1805 Smibert's Faneuil Hall was no longer large enough to serve the city. The renowned Charles Bulfinch, who by then had already completed the new State House, was chosen to expand the hall. In a brilliant design, Bulfinch doubled the building's height and width, and so kept intact walls from the earlier building. Instead of being three bays across, it became seven. A third floor was added, and the building's cupola which had been centered, was moved to the east end, as seen to the left. Summary: Although some Bostonians sniff that Faneuil Hall Marketplace is "too touristy," we believe that the Faneuil Hall experience, which combines the history, the art, the people and the food of Boston, offers something for everyone. We are not surprised, therefore, that for many visitors, a trip to "Beantown" is not complete without a stop here. Located in the middle of Boston, the four buildings collectively known as Faneuil Hall Marketplace -- Faneuil Hall, Quincy Market, North Market and South Market -- hum with the activity of shoppers, diners and sightseers day and night, attracting millions of visitors a year. The structures are grouped around a cobblestone promenade where jugglers, magicians, mimes and bands continually entertain a constant influx of passersby. Built in 1742 and given to the town of Boston by French Huguenot merchant Peter Faneuil, the Hall of the same name was a central marketplace offering an open food market on the first floor and a space for open meetings on the second. 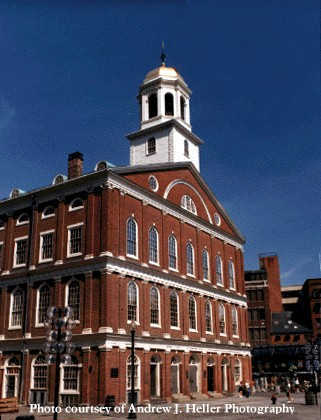 A fire in 1761 destroyed the original Faneuil Hall, but the building was reconstructed in time to host Samuel Adams and his compatriots as they planned Boston's revolutionary activity; the political maneuverings here earned Faneuil Hall its long-standing nickname, "Cradle of Liberty." Indeed, Faneuil Hall's historical significance has earned it a place as one of the 16 sites that make up Boston's famed Freedom Trail. By 1805, the Hall had become too small to serve the needs of the city, and Charles Bullfinch, one of America's foremost architects, was commissioned to design the expanded structure that remains virtually unaltered. 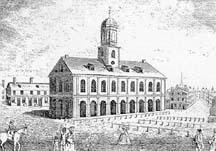 Though an 1822 city charter ended government by town meeting, Faneuil Hall remained the center of Boston political debate until well into the 1900s. During the 1970s, the building underwent a major internal renovation in order to serve the city as it does today. Faneuil Hall's first floor continues to operate as a market, although most of the stores offer handicrafts where their predecessors sold food. We are particularly fond of the local souvenir stores here -- they offer a wide variety of traditional Boston memorabilia (t-shirts, magnets, viewbooks, etc.) at a reasonable price. The foodstuffs in the booths in this area, on the other hand, are relatively bland and overpriced compared to offerings elsewhere in Faneuil Marketplace. The second floor is primarily taken up by the Great Hall, where Boston's town meetings were once held. Now operated by the U.S. National Park Service in cooperation with the Boston National Historical Park, this beautiful, quiet room is a great place to rest and reflect in the middle of a busy day. We recommend staying around long enough to hear one of the Ranger's lectures (held every half hour) about the history of Faneuil Hall. The talks, though not extremely dynamic, are short and very interesting. History buffs should stop by the infrequently-visited third floor, which contains the museum and armory of the Ancient and Honorable Artillery Company of Massachusetts. The Company, which was begun in 1638 for the defense of the colony, has operated in Faneuil Hall since 1746. The 170-year-old Quincy Market, located directly behind Faneuil Hall, served as Boston's wholesale food distribution center until the 1960s. Today, the food stalls inside this stately granite building offer culinary delights to thousands of visitors a day, selling everything from calzones to gourmet soup to frozen yogurt. We consider it an absolute necessity to visit Quincy Market on an empty stomach because it is impossible to sniff all the mouthwatering smells without wanting to taste a little bit of everything. It is also important to go with at least one friend so that you can share and compare your dishes. Make sure to try some of Boston's famous seafood, like a hearty bowl of clam chowder or a plate of fresh oysters, and choose from pastries, fudge, candy, Italian ice or ice cream for dessert. We recommend that you find a table in the center atrium first or you could wind up eating in the standing room only section. Surrounding the perimeter of Quincy Market is a semi-enclosed mall where local artisans and entrepreneurs peddle their crafts in small carts. You can find some truly unique gifts here, including items which can be personalized with name tags or special designs. In general, these mini-shops are quite affordable as well as one-of-a-kind. The North and South Market buildings, which grace either side of Quincy Market, house specialty stores and eateries. If you have the time and the appetite, try a few of the bars and restaurants tucked into North and South Markets. In our opinion, the best sit-down meals and drinks in the Marketplace are found along these sidelines, which are always less crowded than the central area. One of the most popular restaurants, Tex Mex, provides endless homemade salsa and chips to complement everything from their much-heralded fajitas to a savory gazpacho. Faneuil Hall is open on Sundays from noon to 6:00 PM and Monday through Saturday from 10:00 AM to 9:00 PM. Quincy Market hours vary by store. Admission is free. The Faneuil Hall Marketplace is almost always crowded. We recommend that you arrive in the early morning or late afternoon to minimize the risk of being swept away by the hordes of people. Visit Quincy Market first, before mealtime throngs take over, and then pass the lunch or dinner hour by relaxing in Faneuil's Great Hall. The heat averse should also note that Quincy Market's inside food court is not air-conditioned; during the summer it can be positively sweltering during peak meal times, so plan accordingly. And, of course, it is best to visit the Marketplace on a clear day, when the outdoor vendors and performers are in full swing. Located in the center of Boston, Faneuil Hall and Quincy Market are within walking distance of many subway or "T" stops. The closest is Government Center, which is located at the intersection of the green and blue lines and less than a block from the Marketplace. If you do not mind a slightly longer walk, take the red or green lines to Park Street and stroll through Boston Commons on your way. Boston Event Guide Always Something Happening! 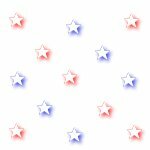 Faneuil Hall Party Tours on the Bustonian Boston Party Bus CLICK HERE NOW!